Located right outside of Washington DC, this casino and hotel complex was designed by architect HKS, Inc. The facility has a footprint of over 800,000-square-feet and consists of a casino, a theater with seating for 3,000 people, and a 23-story hotel. Both structural steel and concrete were used for the primary structural framing of the building. 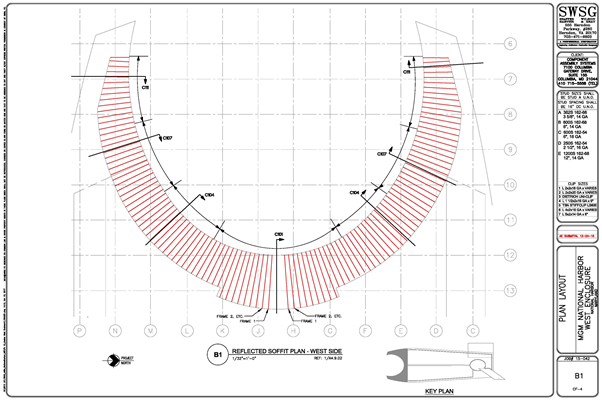 The most challenging design was the West Prow (or the West Casino Enclosure) which consists of 33’-0”-long unsupported soffit and a vertical face varying from 14 feet to 6 feet in height. The complete framing had to be hung from structural steel beams. The load applied along the vertical and horizontal face was a challenge to design and construct. The lateral bracing for these frames were spaced at 5’-0” OC. The curve along the claw made construction even more difficult. 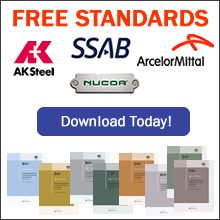 It was required that each individual frame, spaced at 5’-0” OC, be precisely measured from the 3D architectural drawings while calculating the alignment of cold-formed steel frames with respect to the structural steel beams. 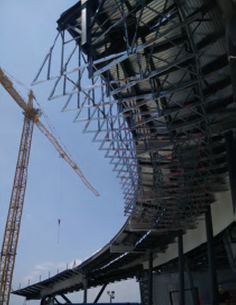 This process was needed to predict all the potential challenges that could arise due to the connection of cold-formed steel studs to structural support. 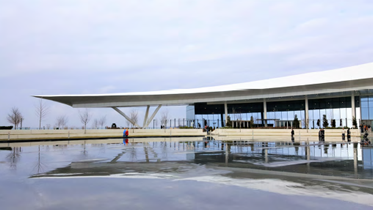 The complete process for the design of 60 different frames used in the West Prow involved extensive study of architectural and structural drawings, coordination with the contractor, Building Information Modeling (BIM), and multiple site visits. Each individual frame had to be supported laterally from a structural steel beam located between two cold-formed steel frames. This required the connection to be kept flexible in order to rotate almost 360 degrees. Another challenge was the coordination required between the different disciplines. 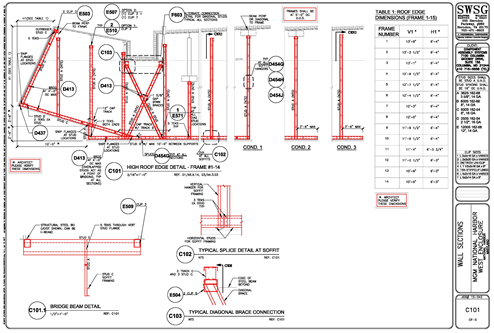 For example, while planning the Unistrut support framing for Level 5 and Level 2, it was important to consider all the obstructions between the Unistrut frames and the structural support slab above. According to Akhil Jain, SWSG’s structural engineer in charge of cold-formed steel framing design for the MGM project: “The BIM group from Component Assembly Systems, Inc. was a great help in sorting out the 3D model of the building and helping us better understand the feasibility of our design.” A thorough study of the architectural drawings, the MEP drawings, and the BIM model indicated the need to use two levels of “trapeze” to support the Unistrut ceilings. Visitors to Washington DC have a magnificent new landmark to explore, just a few miles from the traditional downtown attractions. 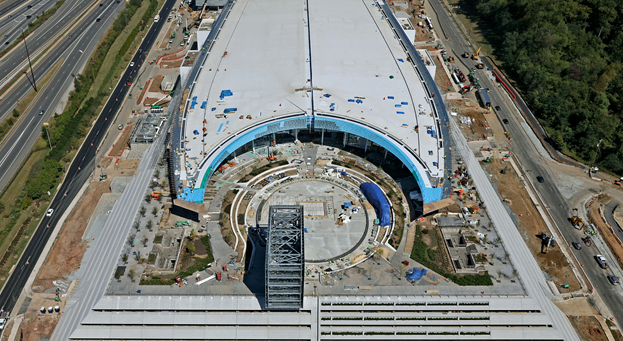 MGM National Harbor demonstrates the design versatility and efficiency of cold-formed steel framing in a creative, dynamic and very large structure. Hit the “F5” button on your keyboard to refresh screen if necessary.